In western counties, fairly common at lower elevations, uncommon and local at moderate elevations, utilizing open habitats adjacent to forest such as clearcuts, farmland, and semi-rural residential development. 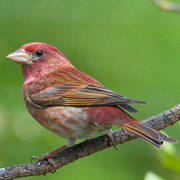 Now nearly absent as breeder in urban and suburban King County, where disappearance over last half-century often ascribed to competition with House Finch (Smith et al. 1997). Decline in Puget lowlands continues beyond close of atlas period as development intensifies. 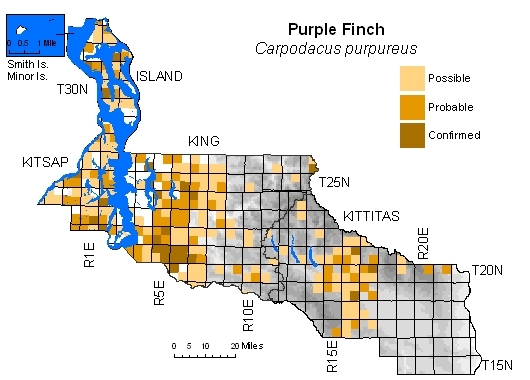 In Kittitas County, locally fairly common in dry-forest zones at moderate elevation, around towns, woodland edges, farmland, and riparian vegetation. Usually absent from closed-canopy, contiguous conifer forest anywhere in four-county area.